<h2>Dark matter clusters could reveal nature of dark energy</h2><br /><p>That mystery is dark energy –&nbsp;the phenomenon that scientists hypothesise is causing the universe to expand at an ever-faster rate. No-one knows anything about dark energy, except that it could be, somehow, blowing pretty much everything apart.</p> <p>Meanwhile, dark energy has an equally shady cousin –&nbsp;dark matter. 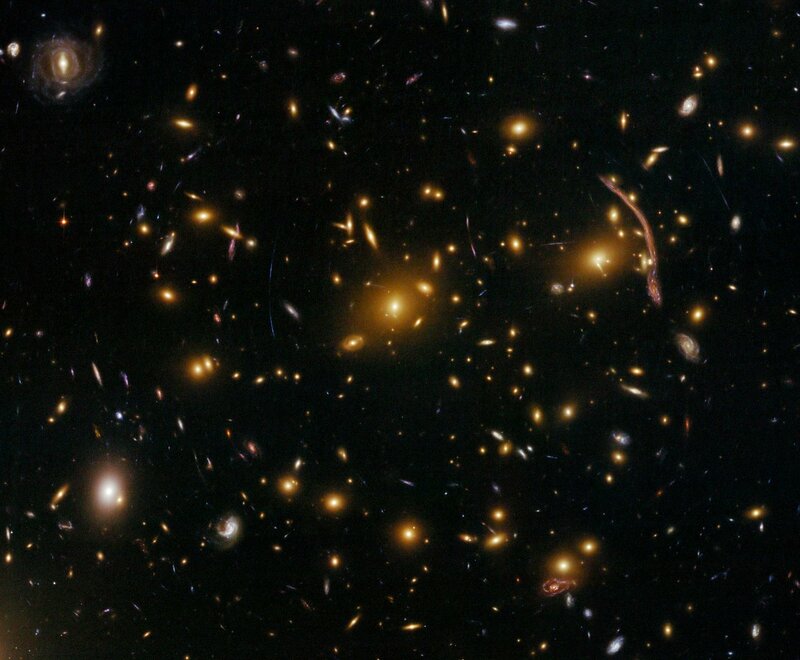 This invisible substance appears to have been clustering around galaxies, and preventing them from spinning themselves apart, by lending them an extra gravitational pull.</p> <p>Such a clustering effect is in competition with dark energy’s accelerating expansion. Yet studying the precise nature of this competition might shed some light on dark energy.</p> <p>‘Many dark energy models are already ruled out with current data,’ said Dr Alexander Mead, a cosmologist at the University of British Columbia in Vancouver, Canada, who is working on a project called Halo modelling. ‘Hopefully in future we can rule more out.’</p> <p><strong>Gravitational lensing</strong></p> <p>Currently, the only way dark matter can be observed is by looking for the effects of its gravitational pull on other matter and light. The intense gravitational field it produces can cause light to distort and bend over large distances – an effect known as gravitational lensing.</p> <p>By mapping the dark matter ​in distant parts of the cosmos, scientists can work out how much dark matter clustering there is –&nbsp;and in principle how that clustering is being affected by dark energy.</p> <p>The link between gravitational lensing and dark matter clustering is not straightforward, however. To interpret the data from telescopes, scientists must refer to detailed cosmological models – mathematical representations of complex systems.</p> <p>Dr Mead is developing a clustering model that he hopes will have enough accuracy to distinguish between different dark-energy hypotheses.</p> <p>‘An analogy I like a lot is with turbulence. In turbulent fluid flow you can talk about currents and eddies, which are nice words, but the reality of how fluid in a pipe goes from flowing calmly to flowing in a turbulent fashion is extremely complicated.’</p> <p> <div class="quote-view quotesBlock quote_horizontal"> <div class="quotesTop"><img src="https://horizon-magazine.eu/sites/all/themes/horizon/images/quotes_top.png" alt="" title="" /></div> <p>‘If dark energy turns out to be a dynamical phenomenon this will have a profound implication not only on cosmology, but on our understanding of fundamental physics.’</p> <blockquote><p>Dr Pier Stefano Corasaniti, Paris Observatory, France</p></blockquote> <div class="quotesBottom"><img src="https://horizon-magazine.eu/sites/all/themes/horizon/images/quotes_bottom.png" alt="" title="" /></div> </div> </p> <p><strong>Fifth force</strong></p> <p>One of the more exotic theories is that dark energy is the result of a hitherto undetected fifth force, in addition to nature’s four known forces - gravity, electromagnetism, and the strong and weak nuclear forces inside atoms.</p> <p>A more common hypothesis for dark energy, however, is known as the cosmological constant, which was put forward by Albert Einstein as part of his general theory of relativity. It is often believed to describe an all-pervading sea of virtual particles that are continually popping into and out of existence throughout the universe.</p> <p>One way to rule out the cosmological constant hypothesis, of course, is to prove that dark energy is not constant at all. This is the goal of Dr Pier Stefano Corasaniti of the Paris Observatory in France, who – in a project called&nbsp;EDECS – is approaching dark-matter clustering from a different direction.</p> <p>Instead of attempting to model clustering from gravitational lensing data, he is beginning specifically with a dynamical –&nbsp;that is, not constant –&nbsp;hypothesis of dark energy, and trying to predict how dark matter would cluster if this was the case.</p> <p><strong>Pushing the limits</strong></p> <p>There are, in principle, infinite ways dark energy can vary in space and time, although many theories have already been ruled out by existing observations. Dr Corasaniti is focussing his simulations on types of dynamical dark energy that push at the edges of these observational limits, paving the way for tests with future experiments.</p> <p>The simulations, which trace the evolution of numerous, ‘N-body’ dark matter particles, require supercomputers running for long periods of time, processing several petabytes (one thousand million million bytes) of data.</p> <p>‘We have run among the largest cosmological N-body simulations ever realised,’ Dr Corasaniti said.</p> <p>Dr Corasaniti’s simulations predict that the way dark energy evolves over time ought to affect dark matter clustering. This, in turn, alters the efficiency with which galaxies form in ways that would not be the case with constant dark energy.</p> <p>The predictions his models are making could be tested with the help of forthcoming telescopes such as the Large Synoptic Survey Telescope in Chile and the Square Kilometre Array in Australia and South Africa, as well as by satellite missions such as Euclid (EUropean Cooperation for LIghtning Detection) and WFIRST (Wide Field Infrared Survey Telescope).</p> <p>‘If dark energy turns out to be a dynamical phenomenon this will have a profound implication not only on cosmology, but on our understanding of fundamental physics,’ said Dr Corasaniti.</p> <p><em>The research in this article was funded by the EU. If you liked this article, please consider sharing it on social media.</em></p> <p><a href="http://bit.ly/newsalertsignup" target="_blank" rel="noopener noreferrer"><img src="https://horizon-media.s3-eu-west-1.amazonaws.com/s3fs-public/IMCEUpload/news-alert-final.jpg" alt="" width="983" height="222" /></a></p> <br /> <img src=”http://www.google-analytics.com/collect?v=1&tid=UA-40077089-1&cid=dark-matter-clusters-could-reveal-nature-of-dark-energy&t=event&ec=republish&ea=read&el=dark-matter-clusters-could-reveal-nature-of-dark-energy&cs=republish&cm=republish&cn=republish&cm1=1" /> This post <a href="https://horizon-magazine.eu/article/dark-matter-clusters-could-reveal-nature-dark-energy.html">Dark matter clusters could reveal nature of dark energy</a> was originally published on <a href="https://horizon-magazine.eu/">Horizon: the EU Research &amp; Innovation magazine | European Commission</a>. Meanwhile, dark energy has an equally shady cousin – dark matter. This invisible substance appears to have been clustering around galaxies, and preventing them from spinning themselves apart, by lending them an extra gravitational pull. One of the more exotic theories is that dark energy is the result of a hitherto undetected fifth force, in addition to nature’s four known forces - gravity, electromagnetism, and the strong and weak nuclear forces inside atoms.